I am Ken Love and I am a Fruit Hunter. I’ve looked for unusual fruit in more than 50 countries and spend a lot of time in South India. I'm also the executive director of Hawaii Tropical Fruit Growers and President of American Culinary Federation Kona Kohala Chefs Association. I'm joined by documentary filmmaker Yung Chang (Up The Yangzte & China Heavyweight). His new film THE FRUIT HUNTERS follows fruit hunters like myself whose passion it is to discover and preserve exotic and rare fruits. UPDATE: Hey all! Might take a little break but please keep the questions coming! Great to speak with so many fruit curious/lovers. Also just gotta plug our new documentary The Fruit Hunters starring other fruit hunters like actor Bill Pullman. Check for info above! UPDATE 1pm EST: Back and answering! Let's say I want to make the world's most expensive fruit salad. What 5 ingredients do I need, and how much should I be charging per serving? Try the miracle fruit * you can get it shipped from miraclefruitman.com. Any of the sweetest mango varieties especially alphonsos. Check out the Int'l Mango Festival in Miami too. I got to try mangos that taste like pina colada, creme brulee and lemon meringue pie. All time fav is a tuff one to answer. Usually fave fruit is the one you get invited to eat in someone's backyard collection. Recently, durian in our fixer's mother's backyard in Bali. Hi. I'm a person with a background in plant science who hopes someday to work with improving these sorts of things. I've got a copy of the Fruit Hunters book right beside me. I'd love to ask a bunch of things. What fruit do you think have the most potential to be adapted to mass cultivation? In my opinion, the goal should be to bring these things to everybody to enjoy, not just have it restricted to certain areas. what are the greatest challenges faced by the promotion of undercultivated species? Lack of cultivars, lack of post harvest methods/ shelf life, lack of consumer awareness, lack of cultivation techniques? What goals do you think breeders should have for developing new varieties of undercultivated fruit? I'm guessing shippability, but any other traits? what do you think the next big thing will be? A while back kiwis, mangoes, and pomegranates were not very common, now they are relatively common. What is next? What is the absolute most bizarre fruit you can think of? Mine is the parasitic Hydnora africana. Finally, any advice for someone looking to work with undercultivated crops? Also, for those who are interested, there is a subreddit at /r/biodiversity for under cultivated species. Its kind of slow going now, but it is there. Sorry about all the questions, and thank you. let me try -- lots haev potential to be a world class fruit with proper horticultural practices, jaboticaba, abiu and green sapote, -- why isnt it happening is well , like bob dylan said, "money doesnt talk it swears". If someoen put in 50 acres here or florida and could wait 10 years for a return on investment-- some of hte fruits would be more popular across north america. sometimes breeders go over hte top especially with prunus hybrids. Nature does a great job on her own given time. i would like to see jackfruit as the next big thing -- if india decideds to do a lot of research and marketing it could be -- that and well you already see the other garcinias and not just mangosteen. i dont like the network marketing part of it. mens more spam in the email! How can people who are not "fruit hunters" get their hands on some of the more exotic specimens in the film? depends on the island but frankies in waimanalo is good -- keauhou farmers market here in kona. Hilo sometimes -- ono farms on maui. Hello Ken! I loved reading about your farm in the Fruit Hunters and have noticed that you have been getting a lot of attention in other media too! Is it possible to come visit your farm in Hawaii? I was really interested in trying when I was on the Big Island in March, but your website seemed unclear on whether folks could just roll up and visit. Suggestions? I'm from southern Mississippi. I can remember fishing on the river as a kid and getting a stomach ache from eating too many. I couldn't help myself. Are Scupperdongs related to scuppernongs? Have you ever accidentally eaten poisonous fruit? How did you end up a fruit hunter? Did you just love fruit, search for it, and then realize that you were suddenly all over the world trying new fruit? Or did you already travel a lot for another reason and then decide to start trying out different fruits? Is there a specific process you go through when tasting fruit, as with wine or coffee, or do you just go for it? And if you have time for a 3rd question: Is there any really great fruit to be found in the midwest? evolution, I did a lot of traveling as a news photographer. but I was already into the fruits. Maybe becasue my father would bring home figs and persimmons and mangos which were pretty unusual for early 1950s chicago. -- there is so much fruit out there to try -- im planning on being back in India next year and have a whole new area to check -- could spend 3 lifetimes just in south india! I once ate a fruit in central Nepal that gave the sensation of one's mouth becoming bone dry upon ingestion. It tasted somewhat bitter. I don't remember what it looked like. Have you ever encountered anything like that, if so what is it? Have you ever found any Devil Fruits? Specifically the Pika-Pika no Mi? I love Durians. Do you? Have you tried the Australian Quandongs? I remember eating them with my grandparents when I was young but haven't tried one since. Do you specifically look for farmed fruit or do you search for bush fruit too? When I was in the Peace Corps in southern Honduras, I got to try a lot of fruits I'd never even heard of before and many of which were absolutely delicious. My #1 favorite were these things, known locally as "mamey". I only knew of a few trees in my area and they were not sold commercially. Do you know where they are native to originally? Are they sold commercially anywhere? mamey sapote is common in florida and you can usually order some from robert is here farm stand in homestead fla. or from the rare fruit groups in fla. makes the best shakes ever! Hey! My father swears that there is an apple that is crystal clear in Mexico, He said that there was at least one big field full of these trees. I cannot for the life of me find what he is talking about! Have you seen these type of crystal apple fruits? He said he could see through them, He is from Santiago Papasqiaro, Durango, Mexico. never heard of or tried it but it would not surprise me. there is so much more out there still to find.! this can be your quest! Hi , just a couple of questions , 1. What is the rarest fruit 2. What is the most expensive . Hello Kevin!!!! What is your favorite food? If you can choose a few of your favorite fruits to be as available as Apples and Bananas in markets, what would they be? In Mexico there is a fruit that goes by the name of "Rambutan" or something like that. Have You had it? What sort of taste did it have? Have you caught a Tropius yet? I've heard they're rare and pretty powerful. what would you consider the most unique citrus type of fruit you have found? How did you get involved in something like that? What fruit that you've hunted is most likely to become a starburst flavor soon? I wish jackfruit -- thats where juicyfruit gum got its flavor! Hi Ken. What is the rarest and most unusual fruit you have hunted? Also, what do you use to take down your prey? Which fruit is the hardest to catch? Meaning are some more stealthy than others, while others are faster than some? that dang kiwi on fruit ninja! Have you ever accidentally made eye contact with another man while eating a banana? Are you annoyed by the word "Organic"? Do you ever travel to a new country and just think "Damn, I'm really sick of eating so much fruit?" Have you been to The Garden of Forgotten Fruit in Pennabilli, Emiglia-Romagna, Italy? If so, what did you think of it? no but next time Im there to see ISabella from the movie, i plan to go-- we did find a lot of unusual figs in the Parma botanical Garden and at a friends farm there. Hey Ken, the documentary looks great. I love berries, are there any odd or interesting berries you can reccomend that are not mainstream? glad you like the movie. -- depends on how one defines berry. there must be 100 types of rubus or raspberries that taste different. Ohelo berry is the only one native to hawaii. poha berry which is more like a tomatillo. midgen berry from the outback. Why are Loquat's so hard to find? i used to eat them as a kid in LA (we had a tree) but moved to the north west and no one has heard of them. Have you ever had a feijoa? If so, can you please try to describe the flavour. I've moved to the UK and miss them so much, and battle trying to describe them. Ah, the feral, Jewish mango. Does the wild mean its Saphardic? all 1500 types of them? Any advice on tracking down organic soursop in the US? I'm a produce buyer from a health food store and I've had tons of requests for it, but I can't find it anywhere! Also, I am getting started in the world of commercial greenhouse hydroponics and I am planning on specializing on unique food among other things. Where is a good place to start hunting down viable seeds of rare varieties? Thanks for this thread, BTW! Do you only hunt organic fruit? Describe your experience eating the best fruit you've encountered. What creative ways can people incorporate more fruit into their diets? Do you artificially select the fruit so the next generation will be bigger? Or do you let it continue to grow as if it were wild? Edit: downvoted for a question?? When you do eventually find that rare fruit within your grasp, how do you treat it? Is it like taking care of the baby, white, albino tiger cub before plucking that fruit and packing it away for all eternity? how do you pick a good durian? smell! color of the shell although some dont start to turn. i like them when they start to split at the bottom. Thank you, they sell them in NYC but I can't get my head around figuring out how to find the good ones. So far the magic is lost on me. Also, have you been to Ono Farms in Kipahulu on Maui? What is the main purpose of your venture? Do the fruits of your labor include any monetary benefits? How long has it taken you to see your film come to fruition? Any fruits you'd recommend for a southern California homeowner looking to try something new? You already responded to another question regarding poisonous fruits, but I'm curious - what kind of scrutiny do fruits undergo before opening them up to a larger audience? I'd worry that a new fruit, while not making you immediately sick, might cause problems later on, from mutagenic compounds, allergic reactions, or from interactions with drugs. For instance, I know that there are many local berries(manzanita or hollywood berries) that are fine in limited amounts, but eating too many will exceed your body's ability to clear cyanide. Was there ever a fruit you ran across that was delicious, yet toxic? The first exotic fruit I ever tasted was a cherimoya from a farmer's market in central California. It absolutely blew my mind. Where would you rate cherimoyas in the pantheon of fruit? its not up to me to open up fruits to large audiences, i just want to find plant and eat them. It also depends on how one defines toxic. Cherimoya isnt butits seeds can be -- same with any of the annona fruits. I love cherimoya but like rollina even more. In Socal, I would contact the local CRFG -- calif. rare fruit growers and see what your neighbors have success with. Talk to the nurserys down there too. try the crfg.org website first. How many durian fruits do you eat a week? Whats your stand on vegetables! I'm in Canada and you didn't find ME! Have you found anything more disgusting (either smell or taste) than the durian? durian never bothered me although I can see how some are -- try ripe noni fruit for a truly bad time! wish we had more Quenepa -- spanish lime - in HAwaii. I dont have one but frankies nursery in honolulu does so i get them from him. Are you the Ken in "Ken's Red Kiwi"? I've been wanting to try it out badly after seeing it in an online store, but ran across this AMA. It sounds possible, so I figured I'd ask. If so, could you tell me about that discovery? nope not me -- have not had one to try yet either. I named a few avocados after friends but nothing for me yet ..
How exactly did you start this career? A specific degree field, or springboard job? Or just wild entrepreneurial spirit? a little of all i guess - it just sort of evolved. I wanted to see small farmers to be able to be sustainable and this is a tool for achieving that goal in Hawaii and a few other places. I've been trying to find these available in the States for years - any ideas of where I can find them or perhaps what I should be looking for specifically. The fruit has many nicknames it seems... guineps is what I remember them by from the Dominican Republic. spanish lime or quenpa -- try puerto rican stores or the miami fruit and spice park -- some people can find them at farmers markets in florida so the fruit grower groups there can help too. What is the most delicious fruit you have ever tasted? mentioned a few about but abiurana is one -- it changes weekly though! I was just in Maui and all the fruit was pretty expensive, even at the farmer's markets. It seems like they would have a ton of Mango and Pineapple for cheap, so why is it still expensive there compared to California? its off season for mango and pine apple -- if you came in june and july its usually a little cheaper. STILL, the ones in calif or shipped in from Mexico and elsewhere where the cost of production is next to nothing. To farm in hawaii costs more than 10 times more than anyplace else. it costs me $2 to grow a lb of lychee but you can buy it from thailand for 50¢ -- until the boats and planes stop -- we have to support and do more to protect local ag. Is there a fruit that you don't like? not up to me but i would guess its ok. Maybe TFN can do this sometimes too. Hey so anyway, the other day I went to the doctor and he says to me "Sorry about this wanders_onto_topic, unfortunately your test results havent come back yet", its like wow I paid 70 clams for this [email protected]#& and he couldve just called me? Anyway I hit up my hot and totally real girlfriend and I'm walking over the road and this large fruit truck comes out of nowhere. It stops so I cross over no probs, I see trucks every day. Reminds me of this one truck I saw at a pit stop. This guy had dinosaur stickers all over his window, not that practical I thought - everyone knows that you go for the stained-glass style stickers since you can see through them. What new fruit was the most disapointing to you (excluding ones most people have eaten, like apples, peaches etc. etc.)? This is awesome! Thanks for doing this. I am a fruit hunter too, but on a very limited budget. I tried a fruit in Central America (it may not have been native there though) and I have been unable to find it in any literature. It was a member of genus Garcinia and had yellow flesh inside. The strange thing was, that while you could clearly see the difference between what would be the purple part of a Mangosteen and what would be the white part, they were both the same schoolbus yellow color and edible in this fruit. The skin was green, and the fruit was sweet and a little tart like a mango. EDIT: added info, the skin was smooth so It was not gambogia, it was green skinned, so I don't think it was Kola. Does anyone have any idea what this fruit was? What is the most delicious sour fruit? I'm sorry Liberace is dead. He would have made an excellent exotic fruit for your collection. i should be so lucky! nope not a dime! 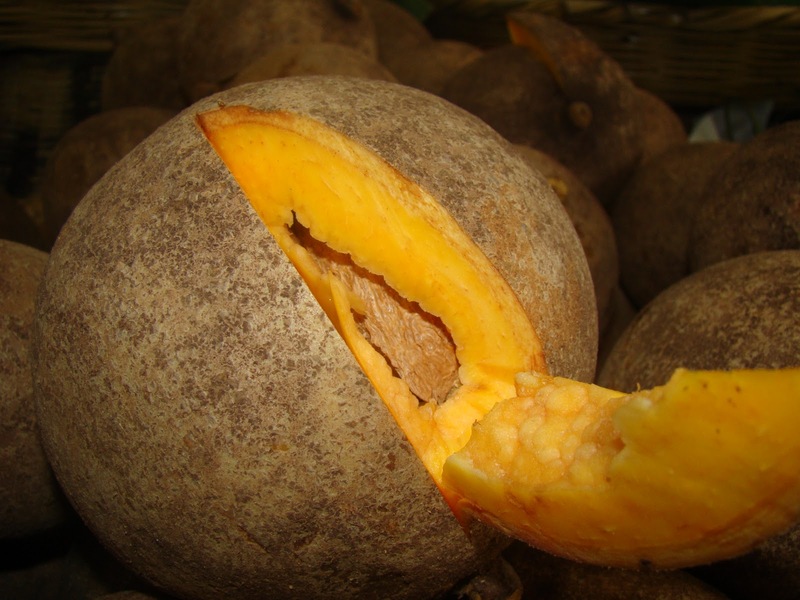 Have you tried lucuma from Peru? Would you consider yourself fruitarian and do you know some of the other "leaders" of the raw food world? When i travel i always like pocketing seeds but i know you can get a hefty fine. Have you ever had trouble traveling with seeds? do you declare them at airports? I have permits from the USDA and it is fairly simple to get and no or very little cost. Just have to find where on the USDA APHIS website. There are some things that cannot come in like citrus, coconut and banana but others are ok with the permits. Have you been to Brazil? We have a lot of fruits that nobody heard of - not even here. There are the fruits from Cerrado, the Amazon and the Atlantic Forest, each ecosystem with a tremendous variety. I have a lot of friends there and family outside of rio but have not been sent there yet. Still, many of the fruit have been in Hawii for many years, I have a dozen different types of jaboticaba. How do I deter monkeys from eating all my fruit?! It's driving me crazy - I get nothing. I recently started taking an interest in fruit, as my wife and I inherited a house with a beautiful mature garden of fruit trees, many of which are new to me. If you're interested, we've got sea grapes, jamoons, mangoes (several types) sugar apples, soursops, a type of small banana known as a fig, pawpaws, barbados cherry, guava, breadfruit, breadnut, golden apples, limes, passion fruit, portugals, oranges, and hog plums. Have you tried bael fruit from India? I know it's not uncommon or anything but do you know what fruit is similar to it in taste and texture? And if it's available anywhere in the US? Which is th most disappointing fruit you ever found, taste wise? Mangosteens are nicknamed the "Queen of Fruit". How much truth is there to this moniker? im the wrong person to ask -- they re too sweet for me! would you ever do a extreme episode and try gympie-gympie? Do you know Butiá? It's my favorite fruit, I live in Brazil, Rio Grande do Sul. I think it's a little obscure fruit, but is crazy delicious. Have you ever tried Urban Foraging? With a name and profession like that, what's your best pickup line? well in the 60s I was free love but now that I'm 60 I have to charge for it!! If you were to get into the fruit growing business in the mainland US, what would be the most profitable fruit to grow? This is a real job? How do I get into it? I work in wine because it allowed me to discover new flavors. Have you tried waterberries, and if so, were? If I wanted to track down a Mountain Fly Honeysuckle (Lonicera villosa), how would I go about doing that? dont really know them as i specialize in tropical fruit although it might be known by another name. Often the same fruit can have a dozen different names in different locations. The Lonicera villosa is native to MAine I think so I would start with the university extension office there. They should be able to tell you how to get one. Been 40 years since I was there! Have you tried our DURIAN FRUIT in the Philippines? yes, in the PI and everywhere else it grows. I'll be in Davao and los Banos in OCt.
Best fruit to get in Toronto? Have you tried pitanga and butiá? If jabuticaba is one of your favorites, these should be on your list. grow a lot of them, especially pitanga -- we call surinam cherry. The univ. has a variety trial now for black varieties. butiá is more rare here but some of the plams are around. Just had dried pitanga rolled up into candy yesterday-- chefs really love this here. green with envy... had butiá my entire childhood, but now living thousands of miles away... never get to have it. We had a pitanga tree in our backyard. Does the old axiom "the darker the berry, the sweeter the juice" hold true? kind of I guess -- haven't read one in a long time. Most expensive Japanese melon is very round. Silly question, but I mean it in earnest. With eating these strange fruits in foreign lands, how many times have you pooped yourself? Seems like a real concern. Never had a problem -- I can say in india though that you want to take your TP with you since they dont use it. Because I have celiac disease if i get contaminated with gluten then I can use what your handle name is! Are there any hardy exotic fruits that could be grown outdoors in colder climates (such as in northern US states like Minnesota? I know this is probably a long shot, but thought I'd ask anyway. Thank you. lots of berries and thinsg like haskap -- check with the univ. local extension office and they should be able to help. Fascinating, thanks for the ama! How are exotic varieties of mango and other fruit developed? What is that really disgusting fruit found in Cambodia called? I like oranges. Do you? Have you ever had a Leichi berry? Those things are super rare, from what I hear. I love cashews and I was surprised to learn that they are part of something called a cashew apple. Ever had it? Why is it called hunting? Unless you're hunting Killer Tomatoes, wouldn't it more accurately be described as gathering? And while I realize that it requires more of an effort than just walking into a field, I've yet seen anyone refer to coleopterists as butterfly hunters, and I've seen those guys running around with nets, trying to catch butterflies, but last I checked fruit tends to be extremely stationary. Why haven't you found a strawberry the size of my head? It seems we could have world peace if people had head sized strawberries. I guess. But still, I'd appreciate a head sized strawberry. Anyway, in your adventures... what is the closest you've come to death or serious peril? Do you go by Ken Love because you don't want people to misread you as Kevin Love the Pro Baller from the 'Wolves? Sorry, dont know kevin or the wolves. Not related to Mike Love of the Beach Boys or Bob Love of the Bulls either. Have you ever come across any fruit that was dangerous, or for that matter, how do you know if what you come across is edible? Can you give some of your favorite documentaries? Like a top 5-10 maybe? And what about non-documentary films? Too many! Check out Lonely Boy (free on National Film Board of Canada site), Little Dieter Needs to Fly by Herzog, Big River Man by John Marangouin, Garlic is as Good as Two Mothers by Les Blank, Naked Island by Kaneto Shindō (not really a doc but kind of is a doc). There's also the epic docs by Wang Bing. Fiction films is like eating fruit. There's a flavour of the month for me. Right now I'm re-digging the French New Wave films. Anything by Truffaut like Shoot the Piano Player and the 400 Blows. Films by Eric Rohmer. Check out Chinese films by Jia Zhang Ke, Hou-Hsiao Hsien, and Edward Yang. Uncle Boonmee by Apitchapong. The list goes on! How do you combat things like the citrus disease that's been affecting Florida oranges? Hey Ken, I work in Thailand right now and wanted to ask you what is the best tasting fruit I can find in the streets of Bangkok? Do you like fresh durian, or the fruit-roll-up-like processed durian? My co-workers share the latter with me, and I've gotten hooked! Also have you ever tried durian chips? The crunch is addicting. Thanks for the suggestion, it took me a while to figure out which fruit you were talking about. Here langsat is known as "longkong," but its a tad too sweet for me! Isn't durian that one that tastes like rotten meat? Have you tried any jambul fruit? What are your thoughts on this fruit? I have a mature tree that bears this fruit in my backyard in calif.
have you ever had the small oaxacan mango that is eaten by just sucking out its juice? A lot of mangos are like that --here, in a good year they are called peach mangos -- in a bad year turpentine mangos -- ate a bunch of them yesterday! I used to be a produce buyer for an ethnic supermarket and by far my favorite fruit was rambutan. Have you tried it? How feasible would it be to cultivate it where I live (mid-Atlantic United States). I used to slip some in my pocket during workbecause they sold for a whopping $25/lb. I know they grow in southeastern Asia, but are there other places they grow? I'm a Timberwolves fan and I read that as Kevin Love. Even though I realize I was mistaken, I will still ask you my question i originally wanted to. Do you think that you'll resign with Minnesota after your current contract is up? What about your player option for 2015-2016 season, do you think you'll pick that up? depends on the salary! Yung -- your in MN all the time -- maybe you should sign! What is the sweetest, juiciest, candy-like fruit you've ever come across in your travels? abiurana which tastes like caramel,vanilla, sweet lemon custard pudding! love it, smell does not bother me-- if someone wants to try something really stinky they should try ripe noni! Over 30 years ago while in Jamaica I was introduced - once - to a fruit called a Nizberry. I remember it was about the size of a Kiwi and tasted like cake. Are you familiar with it? nesberry is chikuor chico. we call it brown sugar chico here. great fruit that I really love -- its also where the first chewing gum came from. Are you a durian fan or not? And have you tried durian ice cream? Alphonso mango is the most delicious fruit I have tried. Do you have a favourite? I like alphonso too but also totapuri and other INdian types but basicall i never met a mango i didnt like! What fruit surprised you the most? Did anything look absolutely inedible, have a horrible smell or anything else, but still taste good? Gamgyul is the best orange I've ever had in my life. Where could I find better ones or can I die happy, secure in the knowledge that I've experienced the best orange this planet has to offer? I didn't see this answered yet - what's your favorite fruit, period? Like, if you could only have one more fruit, and it has to be one you've already tried, what would you pick? Also on the flip side, are there any fruits out there you haven't found yet but are excited to try? What is the worst fruit (in your opinion) you have eaten? see above -- its impossible for me to have 1 favorite. Do you know what this fruit is? Here is a pic of the inside - it's basically like a fig. Found in the jungles of Northern Thailand, outside Chiang Mai. dont know it but your right that it has to be some type of ficus. looks pretty good too. if you search edible ficus you might be able to find it. are there pictures of hte leaves and trunk too? durian ranks up there but marang fruit or pedalai would too. marang is Artocarpus oderatisimuss. Hi all, loved the Fruit Hunters! Will you be announcing more US screening dates soon? Please come back to Raleigh/Durham, NC area! Thanks for going to see the film! Additional screenings in the works. See Docurama, our distributor's site http://www.docuramafest.com/fruit-hunters/ Also super interesting initiative with TUGG to arrange screenings within communities. Check out the links to TUGG. THANKS!!! My dad planted a heritage apple tree, and I am trying to find out the variety. I've done some online research but haven't been able to find anything close to it. Any resources you could point me to? I noticed that there we no pomelos from the US this year at any of the grocery stores in Ottawa this year; only Chinese pomelos were available. Do you know if it was a bad year for pomelos? glad you liked the movie! It was really fun to work with yung and bill and others -- Check with USDA in Ithaca NY apple collection -- send lots of pix of the fruit inside and out and leaves and trees and maybe someone there can help. How do you keep animals like squirrels away from your fruit trees? no squirrels in Hawaii but rats and birds are a problem -- sometimes have to cover the fruit with bags which also helps with flavor as well as protects them from birds.